Saturday 13th April sees the now iconic Record Store Day returning to the UK and there is something here to inspire all high streets! Record stores have been hard-hit by the collapse of physical music sales, there is no doubt about that. HMV has definitely paid the price, making 27 store closures this year. Still, there is an opportunity to be had for the high street, thanks to the independents. And indeed, the success of the record store market offers hope for the rest of the high street too. Record Store Day, this Saturday, consistently brings early-morning queues to the shop doors in towns and cities across the UK, getting people excited about a day’s shopping with celebratory events, promotions and celebrity ambassadors like The Mighty Boosh. Together, record stores and music fans raised vinyl sales by 1.6% year-on-year last year to a 25-year high. This in a sector that had been written off by many! 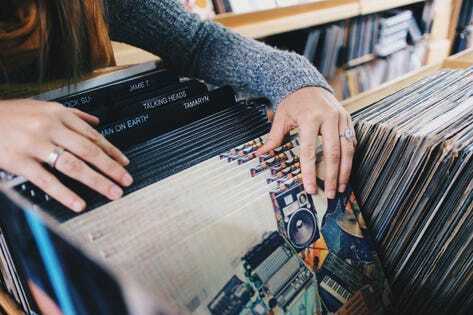 Attracting people into town centres to combat a recent decline in footfall is now the biggest challenge facing high street retailers, and there are lessons from the success of Record Store Day that any high street retailer can use to boost sales and community engagement. Last year, peak b’s Small Business Community Impact report found that 38.4 per cent of small businesses are not primarily driven by profit. What motivates them?Being part of a community, sharing passions and pursuits with others and creating a meaningful life for themselves, staff and family. What do they have that their customers want? The offer of a better retail experience. Research from American Express and GlobalData found that 62% of shoppers said the desire for experiences they could not get from shopping online attracted them to independent stores. Going to a record store is as much about the experience of browsing and speaking to knowledgeable staff as ticking off the shopping list. Customers are going for the look and feel and even smell of the vinyl! They are going for the expertise, they want to chat with staff and other customers, and they go for the experience of being part of a vibrant colourful scene that they just can not experience elsewhere. Facing tough conditions, small businesses are focusing on their customers and their community, catering for their passions as a route to long term success and survival – whether it’s hair and beauty, tattoos, vintage clothing, afternoon tea or vinyl records. Saturday 13th April is a reminder of how small businesses attract crowds of enthusiasts to our town centres – so let’s all be a bit more record store for 2019 and see those high streets thrive once again.